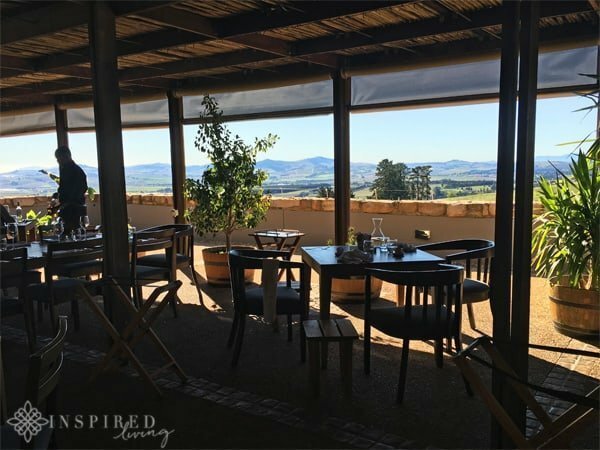 I have wanted to dine at Overture Restaurant for some time now, which is one of the main reasons I added it to my Visit Stellenbosch Bucket List. 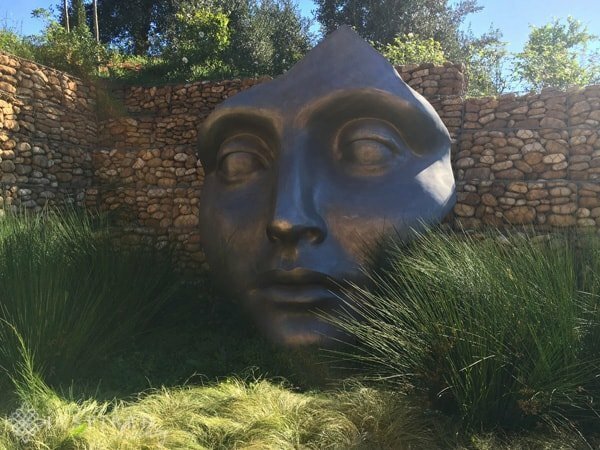 Overture, arguably, has one of the best locations in Stellenbosch! 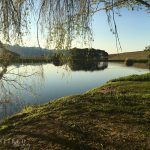 You will find it nestled at the foot of the stunning Helderberg Mountains, at Hidden Valley Wines. 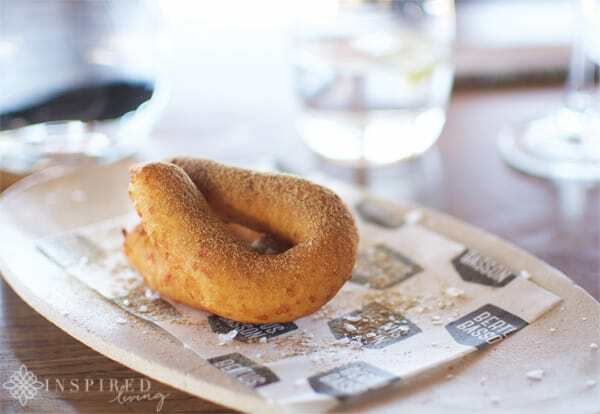 The restaurant first opened its doors in November 2007 and has since become a celebration of our South African culinary heritage. 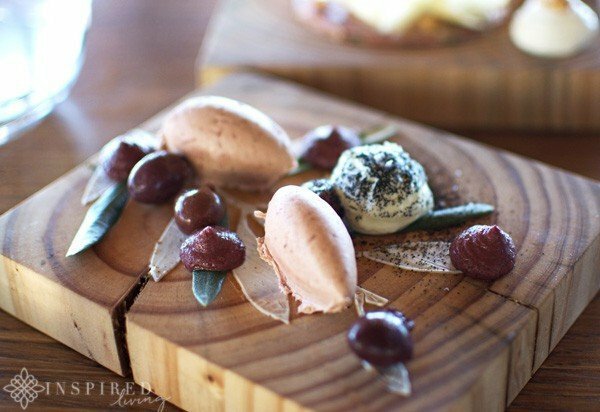 Chef Bertus Basson and his team, create dishes which draw inspiration from childhood memories, and family recipes. 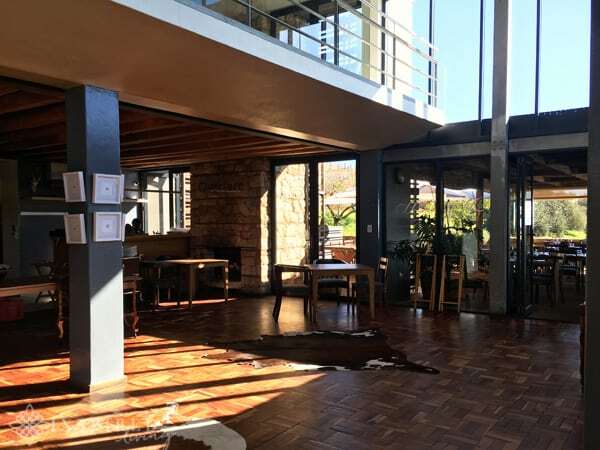 The menu features an eclectic mix of fine dining and traditional South African dishes, creatively woven together. Overture has to date achieved amazing accolades. 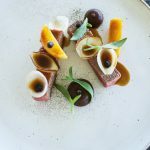 These include a spot in the Eat Out top 10 South African Restaurants, for six years in a row, as well as acquiring three stars in the Rossouw’s Restaurant guide, for four years running. 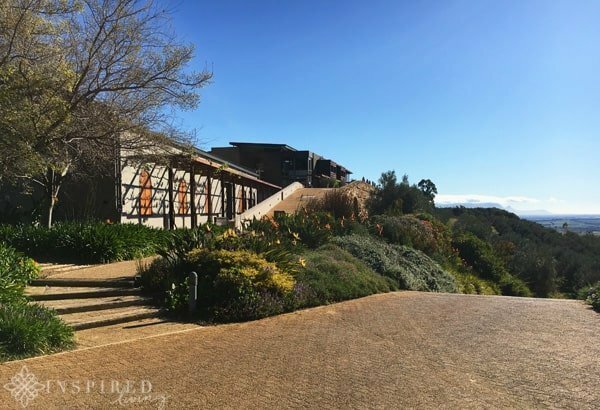 Inspired modern architecture, making use of natural elements of rock and wood, give way to the picturesque views of the surrounding valley and vineyard rows. 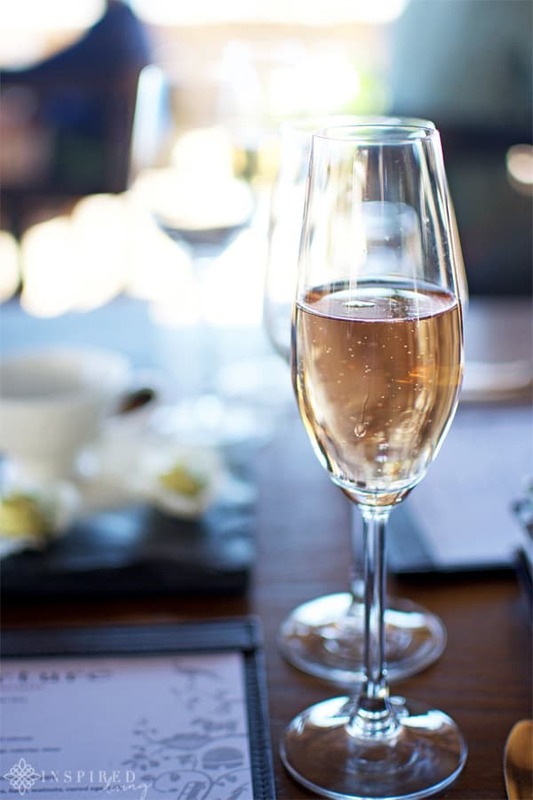 Diners can opt for a 3-course menu (1 Starter, 1 Main course, 1 Dessert) at R425, or a 6-course tasting menu (Chef`s choice, only available to the whole table), at R645. These prices also include complimentary Still/Sparkling water. 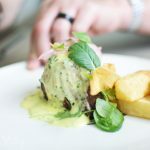 The menu has changed since we dined at Overture but I am going to share a few of our favourites, to give you an idea of the kind of dishes you can expect. You can also visit their website for details on the current menu. The seasonal menu incorporates only the freshest ingredients; minor changes may be made, at the kitchen’s discretion. To get our taste buds firing we started off with a selection of amuse bouche dishes. The Olive Tree ~ a wonderful selection of olive butter and tapenade. 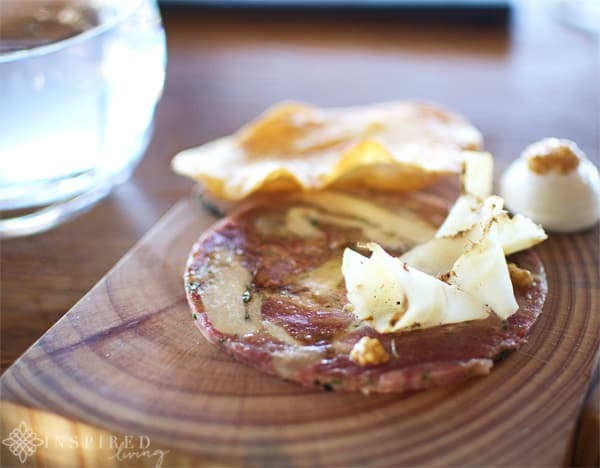 Farmyard terrine, salt baked celeriac ~ a rather unusual combination of flavours, which was utterly delicious. For starters both Grant and I decided on the Home Smoked Trout, with trout tartar, beetroot and apple. This dish was a feast for the senses and a vivid celebration of spring colours. 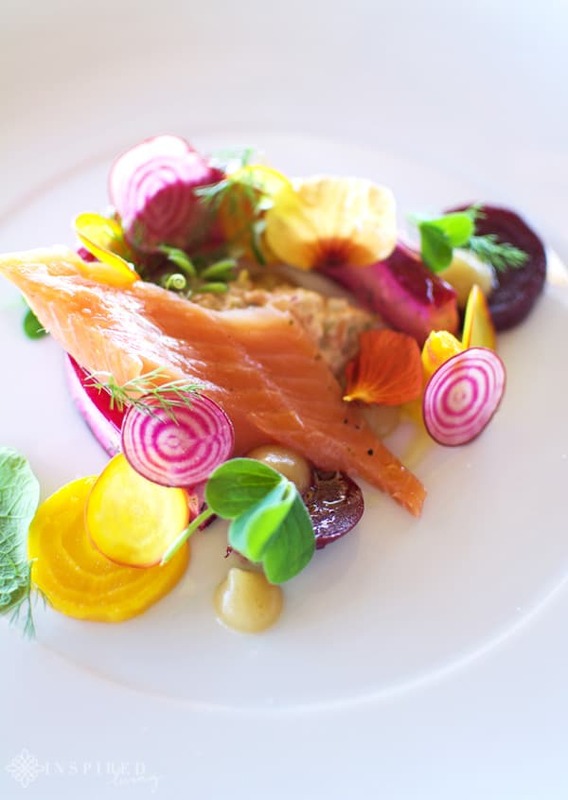 Perfectly smoked trout, complemented by a medley of earthy beetroot and tart apple. 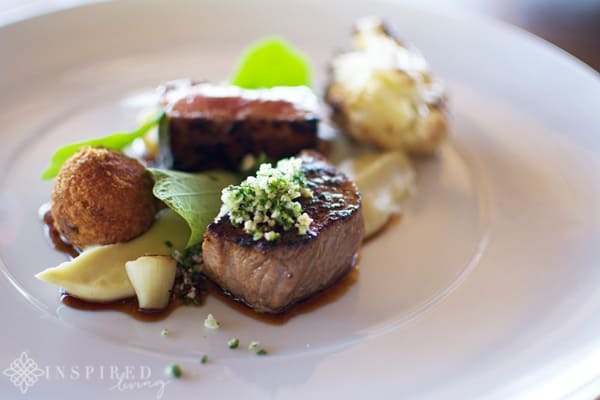 For mains, I chose the Chalmar Sirloin with short rib, roast cauliflower, cauliflower purée and gremolata. The sirloin was cooked to perfection! I loved the smokey flavour of the roast cauliflower and the zestiness of the gremolata, which complemented the Sirloin beautifully. 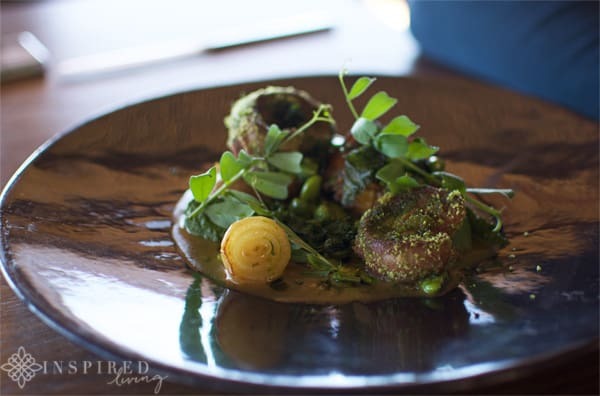 Grant decided on the Lamb Rib, with kidney, broad beans, peas, nasturtium, onion and crispy kale. The combination of beautifully cooked lamb, sweets peas and onion, balanced the rich, meaty flavour of the kidneys. 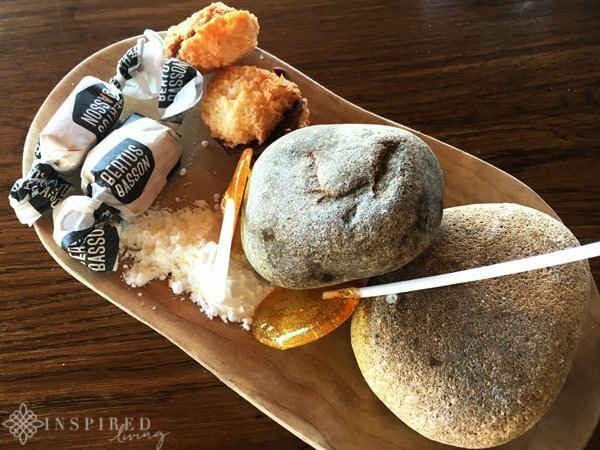 All main courses are served with a side of, parmesan and potato beignet. I hardly had enough room for dessert, but I had to try the Baked Cheesecake, with pampoenkoekie and sesame snap. One spoonful and I was in heaven, and so glad that I managed to find room! The pampoenkoekie was sticky and delicious, and the “cheesecake” added an almost savoury element to the dish. 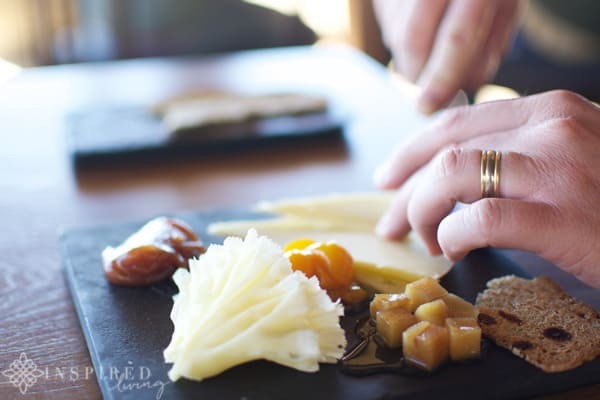 Instead of a sweet dessert, Grant opted for the cheese course. 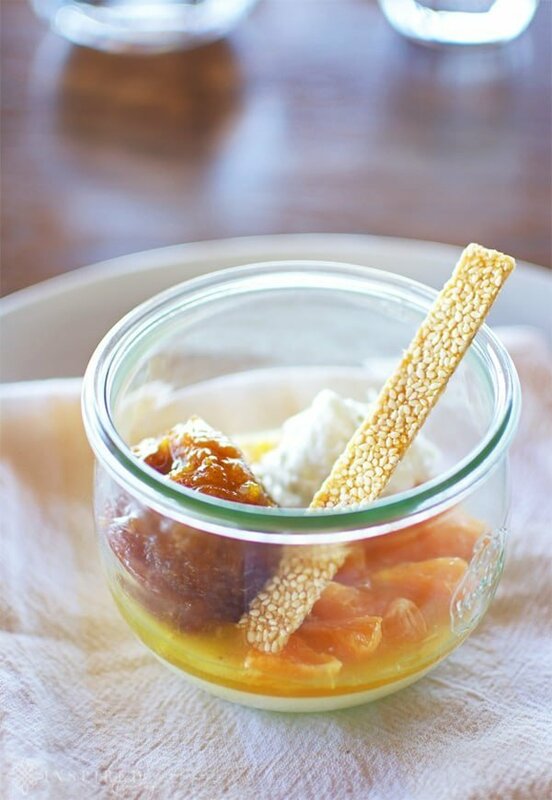 It included Klein River Cheese, served with quince, kumquat, and crisp crostini. We ended the meal with a rather quirky selection of “Petite Fours”, which took us all the way back to childhood. The meal was sublime and the service attentive, without being intrusive. Attention to detail is what made this a dining experience to remember, rather than just a meal, and we will head back soon with friends. 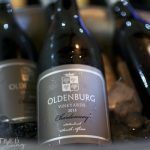 Disclaimer: We enjoyed our lunch as guests of Overture Restaurant and Stellenbosch Wine Routes. This is not a sponsored or paid post. All opinions, content and images are the property of ©Inspired Living and Fiona Rossiter unless otherwise stated. To see more read the full PR & Disclosure Policy below.